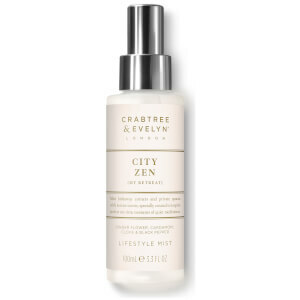 Crabtree & Evelyn's City Zen Lifestyle Mist is a perfumed mist that creates a calming bubble to escape the bustling outside world. Inspiring feelings of calm and Zen, the tranquil mist can be spritzed onto pillows and linens before sleep, or diffused into the air to lend any room an aromatic lift. Powered by notes of Ginger Flower, Cardamom, Black Pepper and Clove, the warming home fragrance will create a safe haven in contrast to busy urban lifestyles. For pillows and linens, hold bottle 25cm from fabric spraying lightly and evenly. As room mist, spray high into the air as needed.